Scientific Adventures for Girls (SAFG) has been working diligently to address the lack of women and minorities in science, technology, engineering and math (STEM) careers. This is a multi-faceted approach, but one very important component of SAFG's program is the incorporation of female role models in STEM careers in our classes. I recently went to a party where there happened to be numerous female engineers. I asked each of them what motivated them to pursue engineering - they all referenced a role model. Be it their parent who was an engineer or a science teacher, each of these women cited a special person in her life who inspired her. As adults, we can all understand how the people in our lives can shape our destiny in one way or another. Given the gender disparity in STEM in our every day lives or in the media, etc. it seems imperative to bring to life the possibility of girls pursuing STEM - to make this option accessible. What better way to approach this than to include the amazing women in STEM in our very own community in SAFG programming? We have been fortunate to have women from Bayer, Tesla, Clif Bar, UC Berkeley, Google, Goldman Sachs among others visit our classes, share their stories and show the girls that science and math are important, practical and relevant to the world they live in. For example, taking things apart is useful in manufacturing engineering or learning math is helpful when managing your money! In this month's newsletter, we would like to highlight one of SAFG's board members and super role model Debbie Senesky. Debbie is an Assistant Professor at Stanford University in the Aeronautics and Astronautics Department. She received her B.S. degree in mechanical engineering from the University of Southern California in 2001, and she received her M.S. degree and Ph.D. degree in mechanical engineering from the University of California, Berkeley in 2004 and 2007, respectively. She was a Design Engineer in 2007 for GE Sensing (formerly known as NovaSensor). 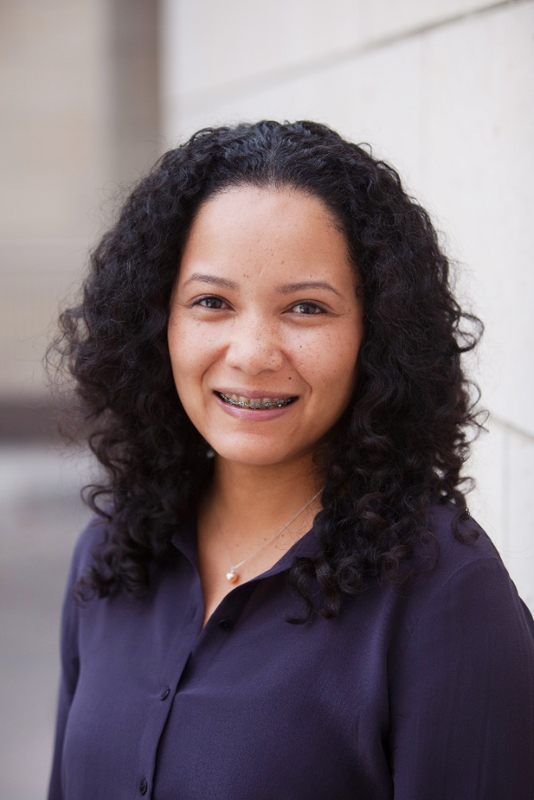 She was a researcher specialist in 2008 at the Berkeley Sensor and Actuator Center (BSAC) developing silicon carbide (SiC) sensing technology for extreme harsh environments. Her research interests include the development of micro- and nano-scale sensors, wide bandgap electronics and ceramic materials for operation within extreme harsh environments. In recognition of her research, she has received the Early Faculty Career Award from NASA in 2012. Debbie shared, "When I was young, I loved taking things apart and fixing them. I once fixed my cassette player by realigning the gears inside. I thought it was so cool to be able to impact the way something worked. Also, I excelled in math and science so engineering was a natural fit. And, I loved (and still do!) solving puzzles." When asked how she felt about being one of the few women in her classes, she responded, "I did not mind being one of the few women (and minorities) in my classes. It was quite thrilling receiving high marks and standing out from the crowd. Also, joining the Society of Women Engineers (SWE) and the National Society of Black Engineers (NSBE) during my studies allowed me to connect and network with other women and minorities around the country...I never felt alone. An engineering professor from my undergraduate studies was my role model. She encouraged me to pursue engineering, a PhD degree and eventually, a career as a professor. I also had a lot of support from my family and friends." As we have learned, "girls can't be what they can't see." 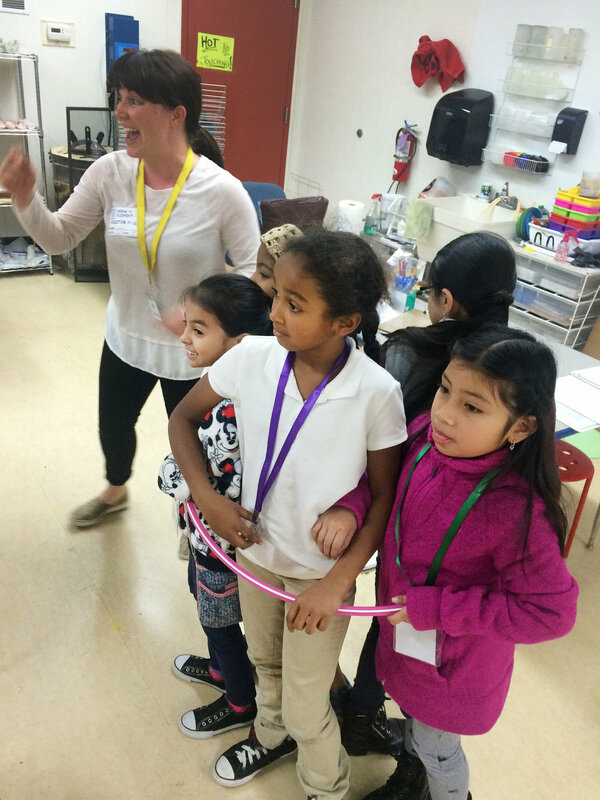 SAFG continues to help change the face of science by exposing girls to the many possibilities -- those in their near future and far -- as well as providing them a community of teachers and girls who support, challenge and inspire them. This winter SAFG is offering five new programs at four different sites. We want to thank the Lawrence Hall of Science for providing us with a Forensics Science program for one of our new sites, Valle Verde Elementary School in Walnut Creek (3rd - 5th). 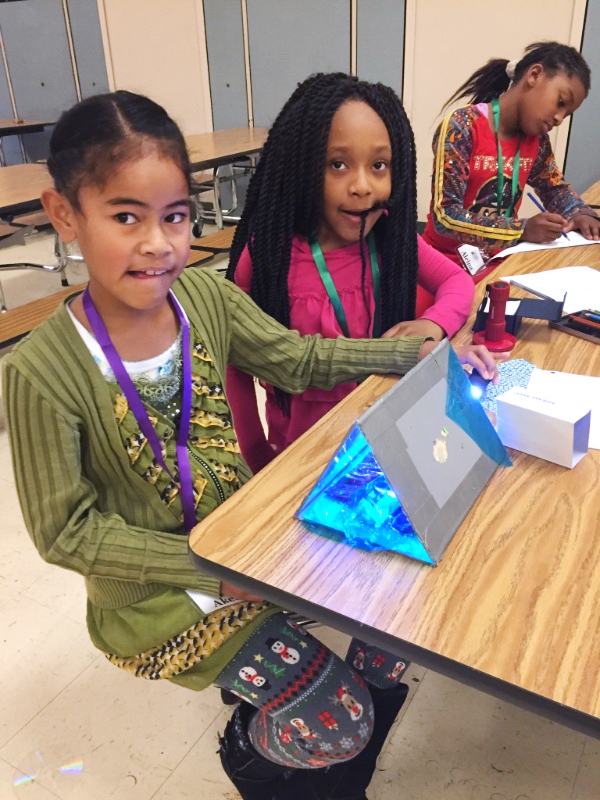 Our K-2nd grade girls will be “Exploring the Natural World” a new curriculum designed by SAFG teachers, Ginny Delaney and Sonia Rawal, at Peralta Elementary, Oakland (K-2nd), Anna Yates Elementary, Emeryville (K-2nd) and Horace Mann Elementary, Oakland (3rd-4th). We are introducing a Chemistry program, compiled by SAFG teacher Rachel Anderson, to our 3rd – 5th graders at Anna Yates Elementary. Finally, Deanna Gelosi is leading a computer programming class for 3rd - 5th graders at Curiosity Hacked Oakland Lab. As always, SAFG classes are teaching the girls it is okay to make mistakes, the importance of collaboration and persistence and how to think like a scientist. At the beginning of each class, we ask the girls to draw what they think a scientist or engineer looks like. Co-founder Courtenay Carr Heuer attended a STEM conference in which the 200+ adult participants were asked to do draw a scientist. Overwhelmingly, there were about 195 pictures of Einstein. Well, that is not the case in SAFG classes. We are pleased to see the girls drawing pictures of women - and even better themselves! Our goal at SAFG is to normalize STEM and the expectations of girls to be a part of STEM throughout their lives. SAFG is "changing the face of science"! SAFG opened registration for Summer Camp 2016! This summer the girls will learn what is GREEN DESIGN and how to build environmentally sustainable structures. Focusing on playground structures, campers will select materials that maximize fun while minimizing environmental impact. Campers will also have the opportunity to meet with female experts in science, technology, engineering and math fields. Please visit our website to register now! Enrollment is limited to 16 girls per session. SAFG is looking for role models and volunteers for our classes. If you or someone you know would like to volunteer, please email us. We are welcoming a new head teacher this fall at Valle Verde Elementary. Stephanie Chiang is a seasoned science teacher with over 10 years’ experience, 5 of those years specifically working with all-girl STEM classes. She received her BA in Chemistry from Cornell University and her MA in Curriculum and Teaching from Columbia University. We are so lucky to have her teaching our girls! We are also welcoming two new assistants in our classes at Anna Yates and Peralta. Cindy Alvarez (not pictured) is a recent grad from UC Berkeley with a B.A. in Cognitive Science, with a concentration in Computational Modeling. Elaine Addison (pictured to the left) has a rich background as a trained British nanny (NNEB), who studied Montessori and has worked all over the world with children, including volunteering for the past two years in her own children’s elementary school science lab. Welcome Stephanie, Cindy and Elaine! We are always looking for wonderful teachers. If you or someone you may know would like to work for SAFG, please email us with a cover letter and resume. Scientific Adventures for Girls is thrilled to announce it just received a grant from Red Oak Opportunity Fund in Oakland. Thank you to ROOF for its generous support. We also want to thank everyone who donated during our December 2015 donor drive, especially Mark Schroeder for his very generous donation of $2000! If your company provides small grants to programs like Scientific Adventures for Girls and would like to sponsor a class, please email us. In addition, we would love to come speak to your company at a brown bag lunch to spread awareness of and gain support for our mission. If you would like to donate and support girls in science, please go to our website. VALENTINE'S DAY CANDY HEARTS DANCE PARTY! Get out your unopened soda, the glass and four conversation hearts. Fill the glass nearly to the top with the fresh soda. Take the four conversation hearts and drop them, one at a time, into the soda. What happens when you drop the hearts into the soda? Watch the soda for a few seconds. What happens to the conversation hearts shortly after they've been dropped into the soda? Watch the soda for at least five minutes more. What happens to the conversation hearts in the soda over time? Can you explain the behavior of the conversation hearts in the soda? How do you think carbon dioxide gas is involved? Did the conversation hearts first sink to the bottom of the glass but then, over time, float back up—and then down again—in the soda, "dancing"? 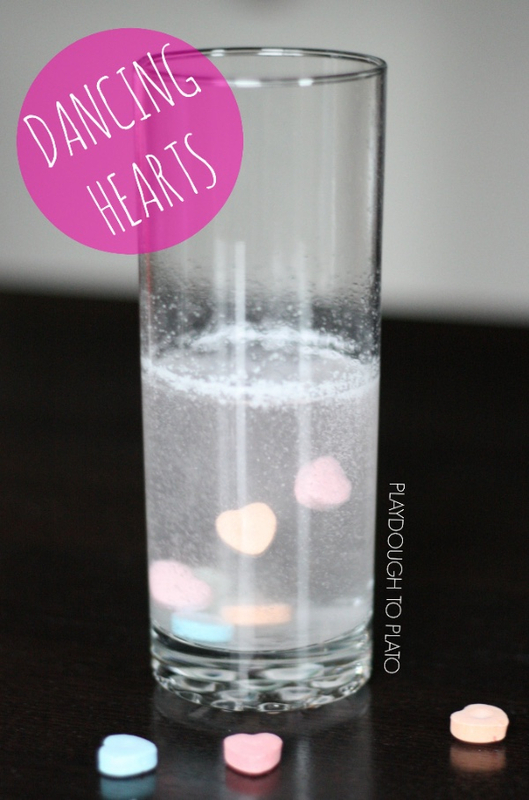 In this activity you dropped conversation hearts into a glass of freshly poured, carbonated soda. Because the conversation hearts are denser than soda, they should have quickly fallen to the bottom of the glass. But then something interesting should have happened. After a couple of minutes, some (or all) of the four candies should have slowly begun to rise up through the soda. The carbon dioxide bubbles in the soda were sticking to the candies, and when enough lighter-than-soda bubbles accumulated on a given candy, they should have lifted it up through the soda. Once at the top of the soda the carbon dioxide bubbles could escape into the air, causing the candy to sink once again. But as the candy sank, more bubbles should have stuck to it, causing it to rise again and repeat the cycle. This up-and-down motion makes the conversation heart candies appear to slowly "dance" in the soda. Copyright © 2016 Scientific Adventures for Girls, All rights reserved.